This weekend, we remember the sacrifices of those who gave their lives for Canada’s freedom. 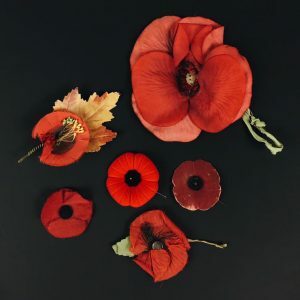 You may wonder why the poppy is a symbol of remembrance in Canada, as seen in these various poppies from our collection. In 1915, Canadian physician Lieutenant-Colonel John McCrae wrote a poem called “In Flanders Fields” on a small scrap of paper after his fellow soldier’s death. His description of poppies blowing between the rows of fallen soldiers’ crosses has become a part of Canada’s national consciousness after its publication in the same year. The poppy officially became a symbol of remembrance for the Royal Canadian Legion in 1921, and has been worn close to our hearts each Remembrance period since. These poppies are on display at the Museum over the weekend for Remembrance Day.